As I'm waiting for 2006 to arrive, I might as well write one last entry for 2005. Today began with some sad news: my sister's thirteen-year old Shih-tzu died this morning. He was suffering from not only kidney failure, but many other ailments of old age: deafness, blindness, arthritis. It was time. But the passing of a companion animal is never an easy thing. 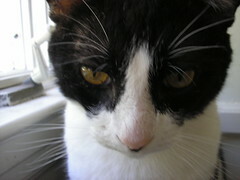 Last December, as I've mentioned here before, I lost my 18-year-old cat, Kitty, to kidney failure. And I've spent the year since trying to regain a balance of animals in my house. We met Casey at our local Petco last year on New Year's Day. 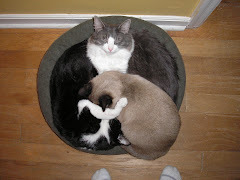 He came to live with us a few weeks later, after we gave it a lot of thought and were assured he was a sweet-tempered cat who wouldn't bother Clyde, our surviving 18-year-old. 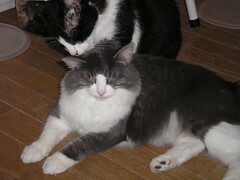 As you can see, Casey is pretty nice to Clyde. Clyde, however, is fairly indifferent. He doesn't even groom himself. But at least we appreciate Casey's help in that area, even if Clyde doesn't. 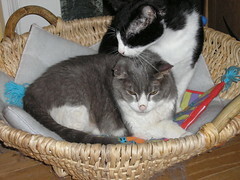 Even though Casey didn't bother Clyde, he was, at an estimated age of 5 or 6, a good bit livelier than Clyde, so thought he needed someone closer to his age to play with. 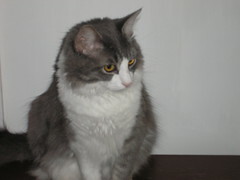 We looked and agonized and rejected very young cats before meeting Gabe at the Humane Society in March. Yeah, they said he was 3, but he's not. He's just getting around to being one or so. And so ensued the Gabe and Casey wars that gave us so much grief: Gabe had way more energy than Casey could deal with. But, really, isn't Gabe one of the cutest cats you've ever seen? And very sweet. So, despite his aggression, we were pretty much in love from day one. Get another cat, some told us. A cat closer to Gabe's age, one that he can play rough with and so stop bothering Casey. Um. We tried that one, remember? We weren't so sure we should try it again. But try we did. In August. And that has a sad ending, which I won't recount here. Finally, we decided to try once more. 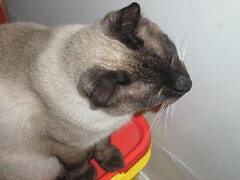 We met Simon on October 1 in Lee's Summit, where the KC Siamese Rescue folks were showing some of their cats. He gave us nice head butts, and so we brought him home. 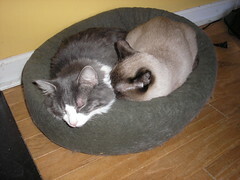 He was also one year old or so, so we crossed our fingers that he and Gabe would get along. And, friends, they do. Even Simon and Casey get along. We took a month to introduce them slowly, and it's paid off. Look at those guys. Yes, it's true that Gabe has a scrape above his eye that's probably from Simon, but all seems forgiven. And who could have imagined this scene between Gabe and Casey just three or four months ago? So it ends well, even as we mourn the passing of another companion animal. So it ends, the year in cats. I know a number of fellow bloggers will be heading off for MLA and the quasi-hell of selling oneself next week. Having done my share of MLA interviews, I wanted to say: you will survive, you will do well. Best of luck. Remember to treat yourself well. Really. Eat good food, get some exercise, and do whatever it takes to keep yourself feeling well. Come autumn, come cool weather, come the holidays, I reach for cinnamon. Ah cinnamon. Cinnamon. Just sounds nice, doesn't it. Cin.na.mon. Opened up a fresh jar of organic stuff from Frontier. Cooked up some Polvorones de canela, some of my favorite cookies in the world. And made with fresh, fresh spice. Mmmmmm. And, just like dark chocolate, it's good for you, too. It's cold here in central Missouri. Real cold. Colder than Milwaukee is right now. With about five inches of snow on the ground and streets cleared only so so. C. and I decided to take a little break this afternoon and get away from campus for a nice hot coffee drink. Headed south of campus in our car. Hit a slick spot. Went swerving across the lanes, finally spinning across two lanes of traffic and hitting the center median. Fairly softly. So I'm thankful. Thankful for the soft landing. That the traffic on a very busy roadway at a fairly busy time of day slowed down enough to avoid us in our spinning. That the traffic coming toward us as we sat facing the wrong way on the road, unable to get moving, waiting for a tow truck, also missed us. That the several cars hitting the same slick spot we hit also missed us in their spinning. Yes. Thankful. Hi Josh, I am enjoying some idle time and looking to see what white will bring up. My e-mail for peer reviewing and the like is certainly interesting and informative. white is a good word to bring into the conversation. Great post. Enjoy your day! The word "white" in the first sentence is a link (which I didn't click for fear of attracting new spam), so I suppose the whole point is to get someone, anyone to click that link. It doesn't really matter if the content makes no sense. It's just a link to allow for contagion. Links call out to us. We want to be moved by them. See where they take us. Because I'm tempted, you know. Tempted to click it, even though there's almost no chance that I'll care about the site I'll be transported to. White is a good word to bring into the conversation. That's advice you can live by.